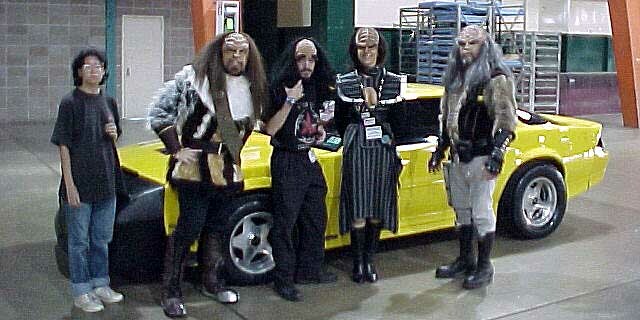 Gary Laesser's girlfriend, Me, Gary Laesser, Jan Goodner, and Rusty Lange with the SevenUvNine car at Trek Expo 2001 in Tulsa, Oklahoma..
At Trek Expo 2000, I felt like a goober for wearing the headpiece without an entire costume. 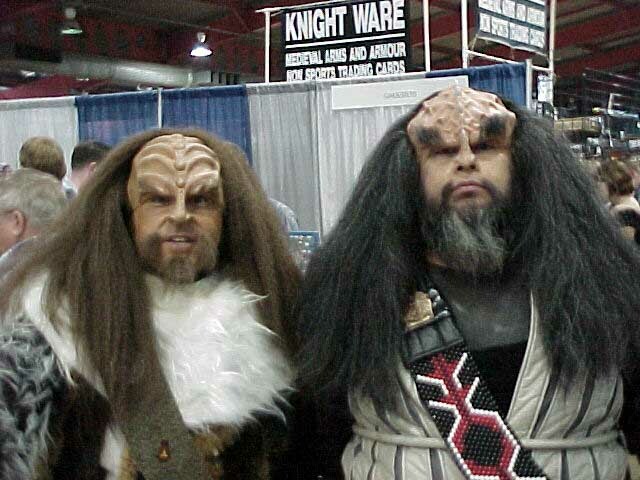 Kevin Clark had made me two headpieces and a disrupter, and with a year to work on a costume, I was ready to have a great time as my Klingon alter ego, K'Gor. And, while my beard and mustache bits were glued on, Kevin's were the real thing. I don't suggest testing my word on this by using the old "grab and pull" technique. This Trek Expo experience was much more fun than the last. For one thing, I was in costume for over 12 hours each day. Let's just say that I now have a greater appreciation for what the actors go through on a daily basis. 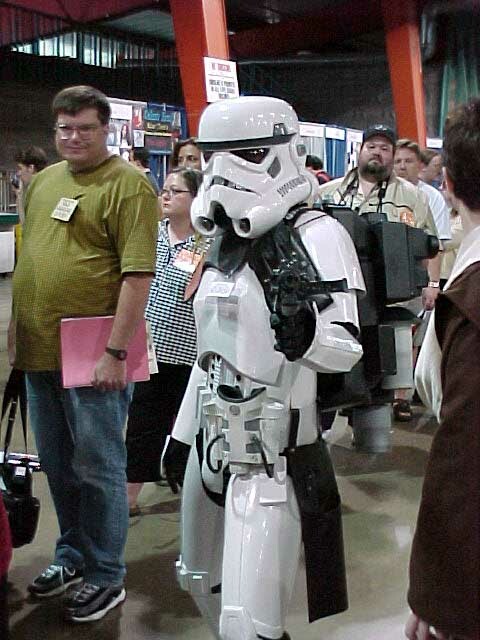 Due to wearing my costume, I quickly became a target for the the other fans who wanted pictures with me. Now that was fun!! DOOooooh!! I drew my camera instead of my disrupter. John Mercer, Me, and the UPN girls with the SevenUvNine car. And then there was John Mercer. I was more interested in the UPN girls, but John convinced me to have a photo with him, his car, and the UPN girls, so why not? John's car is called, SevenUvNine, and has photos and autographs everywhere. 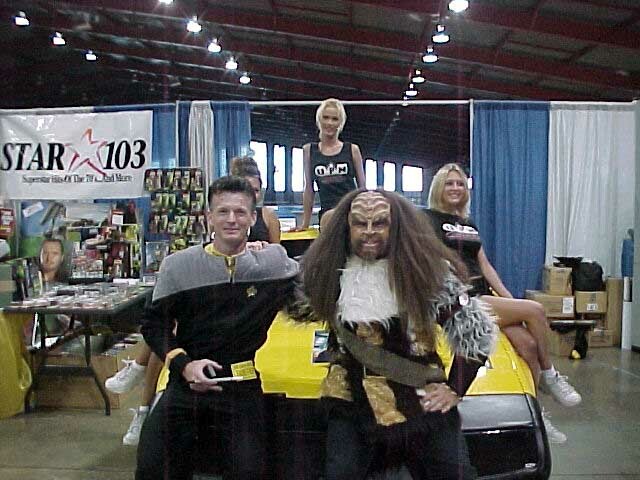 John has taken his car to conventions all over the country and even has book out entitled, "Where No Car Has Gone Before". Since I was working during most of this convention, I didn't have the luxury of taking photos whenever I wanted to. So, all I've got is what you see here. I did manage to get a lot of autographs however. Volunteer work has it's perks! Celebrities pictured here, in photo sequence, are: Jimmy Doohan (ST:TOS as Scotty), Adam West (Batman from 1960's sitcom), Gary Lockwood and Keir Dullea (2001: A Space Odyssey), Judson Scott (ST: The Wrath of Kahn), Tony Todd (Kurn on ST:TNG and ST:DS9), Celeste Yarnall (ST:TOS - episode "The Apple"), France Nuyen (ST:TOS - episode "Elaan of Troyius"), Herbert Jefferson, Jr. (Boomer on the original Battlestar Galactica), Jeremy Bullock (Boba Fett from Star Wars), and Kevin McCarthy (Invasion of the Body Snatchers 1956 and many other films).